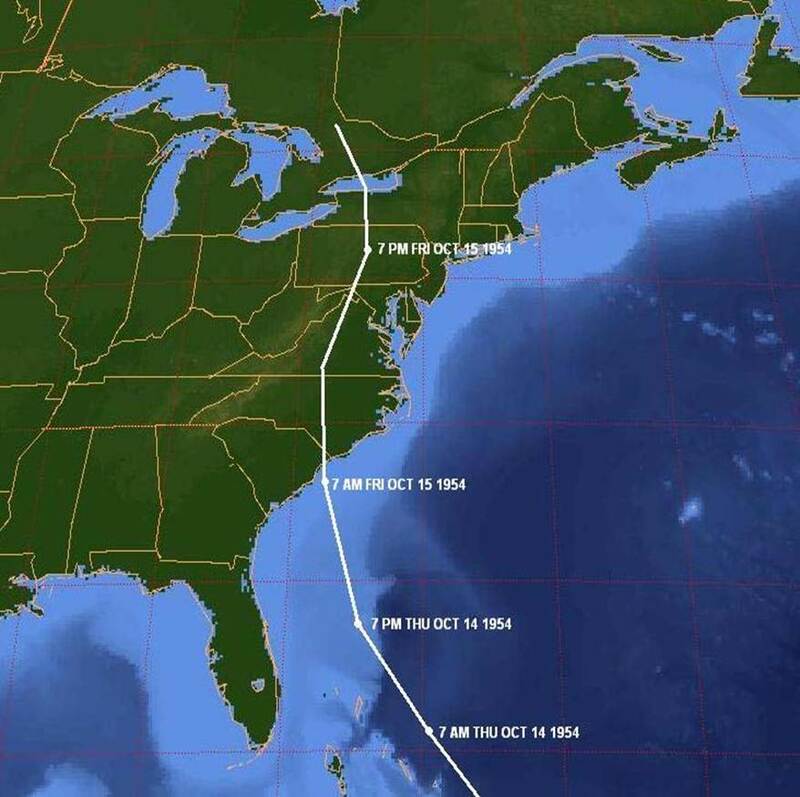 Hurricane Hazel was the deadliest and costliest hurricane of the 1954 hurricane season (Figure 1) and is the strongest and only Category 4 hurricane to ever hit the North Carolina coast. The first indication that a tropical cyclone had formed came on October 5, 1954 about 50 miles east of the island of Grenada in the Windward Islands. Hazel moved westward over the Caribbean Sea through October 8 before sharply turning northward under the influence of an upper level low that was situated over the western Caribbean Sea. By October 9, Hazel had intensified into a powerful Category 4 storm with maximum winds of 135 mph. Between October 9th and 12th Hurricane Hazel moved northward and then north-northeastward crossing western Haiti on October 11 leaving a death toll estimated to be between 400 and 1,000. As a result of the passage over Haiti, the maximum winds diminished to 100 mph, but after clearing Haiti, Hazel was once again over warm tropical waters and began to strengthen. Hazel gradually turned back northward passing over the southeastern Bahamas on October 13, then turned more northwestward on the 14th when hurricane hunter planes found Hazel’s maximum winds had increased to 150 mph with the center now moving at a rapid 30 mph in response to a strong upper level trough moving eastward over the Mississippi Valley. Landfall occurred on the North Carolina/South Carolina border (Figure 2) on the morning of October 15th as the system was starting to transition into an extra-tropical storm. The coastal area near the landfall was battered by winds estimated to have been as high 150 mph. Winds of 98 mph were measured in Wilmington while winds were estimated at 125 mph at Wrightsville Beach and 140 mph at Oak Island. A storm surge of over 12 feet inundated a large area of coastline reaching as high as 18 feet at Calabash, where the storm surge coincided with the time of the lunar high tide and Hazel nearly wiped out Garden City, SC. As Hazel moved rapidly inland, its winds only slowly diminished with a gust to 110 mph reported at Fayetteville and 90 mph at the Raleigh-Durham Airport. Wind gusts near 100 mph were reported from numerous locations in Virginia, Maryland, Pennsylvania, Delaware, New Jersey, and New York as Hazel raced northward. Myrtle Beach, SC reported a peak gust of 106 mph; Washington DC reported sustained winds to 78 mph while peak gusts to over 90 mph were reported far to the north in New York state. In New York City, a peak gust of 113 mph was recorded at the Battery at the south end of Manhattan. Figure 2. Surface Weather Map from October 15, 1954 at 11 AM showing Hurricane Hazel along the Carolina coast. At 11 a.m. EDT on October 14, 1954, The U.S. Weather Bureau (precursor to the National Weather Service) issued a warning for the Carolinas, although the forecasters felt the center of Hazel would remain offshore and weaken. Instead the hurricane took a northwest turn and headed toward land. Forecasts were updated to indicate landfall near the North Carolina/South Carolina border. Massive evacuations were ordered along the Carolina coastal regions at this time. Hazel made landfall as a Category 4 hurricane near Calabash, North Carolina, close to the North Carolina/South Carolina state border, halfway between Myrtle Beach and Wilmington. The hurricane brought a storm surge of over 18 feet to a large area of the North Carolina coastline, producing severe coastal damage. Intensifying the damage was the fact that the hurricane coincided with the highest lunar tide of the year. Brunswick County suffered the heaviest damage, where most coastal dwellings were either completely destroyed or severely damaged. For example, in Long Beach, North Carolina, only five of the 357 buildings were left standing. As a result of the high storm surge, the low-lying sandy barrier islands were completely flooded. The official report from the Weather Bureau in Raleigh, North Carolina stated that as a result of Hazel, "all traces of civilization on the immediate waterfront between the state line and Cape Fear were practically annihilated." The December 1954 NOAA report on the hurricanes of the year states that "every pier in a distance of 170 miles of coastline was demolished". In Carteret County, Hazel washed out numerous bridges and causing tremendous property damage. Tony Seamon and his father, owners of the Sanitary Restaurant in Morehead City, drove to the restaurant during the storm and cut holes in the floor to drain the rising water out of the building. Their effort saved the restaurant, and it was able to serve as a feeding center after the storm. The damage from Hazel was not limited to the coast. With Hazel having a forward speed of as much as 55 mph at times, the Raleigh-Durham Airport reported sustained winds of 75 mph with gusts to 90 mph. With such high winds state-wide, heavy damage was caused to forests, and to property as a result of falling trees. In North Carolina, the most rain was received in the interior of the state: Robbins received 11.3 inches of rain, and Carthage received 9.7 inches. Nineteen people were killed in North Carolina, with several hundred more injured; 15,000 homes were destroyed and another 39,000 were damaged. Damages in the Carolinas amounted to $163 million. Beach property incurred $61 million of damage alone. Elsewhere in the eastern United States, damages were estimated at $145 million for a total of $308 million in losses from the hurricane.